With my first class meeting on Friday morning – all morning – today’s “Words on Wednesday “is sparked by my work today: using the new Workshop Packet marking up notes to outline the general week-to-week discussion plan. A note about page numbers in the PDF: I’ll refer to page numbers you’ll find in the bottom right corner of the PDF. Do take time to reflect on Brookfield’s opening pages addressing theoretical underpinnings , including: (a) Ten Questions that focus on addressing what and why of our experience and practices, fears and resistances regarding discussion as a mode of learning (pages 3-4); and (b) brief sketches of theoretical foundations from Jurgen Habermas and Herbert Marcuse, each writer addressing why and how of vital, forthright discussion (pages 5-6). Notice Brookfield’s own praxis foundation, set out in seven key points (page 7). Three capture my attention this term: Avoid summaries of discussion. Discussion leadership is crucial. DIscussion is always culturally grounded. Do review al the discussion options, then select just the few that will help your students deepen their learning of course content and broaden their ways of communicating course ideas within real contexts and to real audiences. Discussion as a Way of Teaching is rich with opportunities – start with 2 to 3 specific moves anchored to learning outcomes and disciplinary communication practices. For example: Introduce students to Conversational Moves and Conversational Roles (pages 12-13). Link to that discussion of course readings via practices including Chalk Talk with Index Card Debrief, or Quotes to Affirm/Challenge with Learning Audit. 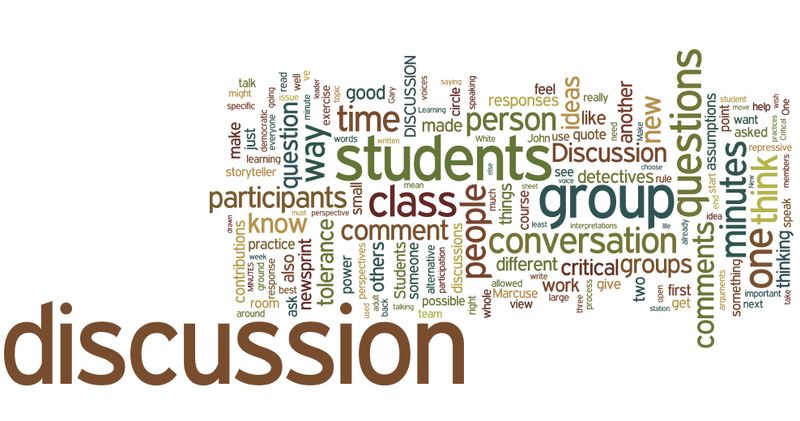 Take time to comment on a discussion just completed by making use of a Discussion Inventory or Discussion Audit, and wrap that with a Student Self-Evaluation. The possibilities are rich. And for helping students – as well as you-the-teacher – visualize the processes for each of the possibilities Brookfield sets out, see the PowerPoint slides he provides to accompany the PDF: Discussion_as_a_Way_of_Teaching.